Penicuik Athletic midfielder Sam Jones insists the players are desperate to put on a show for their supporters in the club’s final home game as a Junior outfit when they host Dundonald Bluebell in the semi-final of the East of Scotland Cup tomorrow. Jones, who picked up the club’s Players’ Player of the Year gong at their recent awards bash, has been a revelation for Johnny Harvey’s men in the centre of midfield this season after making his loan move from Berwick Rangers permanent in the summer. 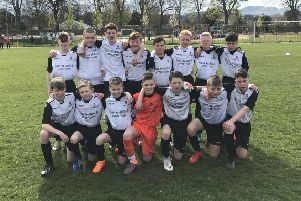 The former captain of the Shielfield Park club’s Under-20 side has shone in the middle of the park for the Cuikie this season as they recorded their highest-ever finish – a third place spot – in their last season in the Super League. Penicuik are desperate to secure their spot in the final, more so after losing out to local rivals Newtongrange Star on penalties in their Fife and Lothians Cup semi-final last week, a result they wish to atone for. “It was a tough one to take going out on penalties,” continued Jones. “It was a game we should of maybe won in normal time; we certainly had the chances. We were just unlucky on the day and we want to make up for that on Saturday. We want to put on a good performance for the supporters and everyone that has got behind us this season. Jones was delighted to be recognised by his team-mates at Penicuik’s end of season awards night, although he reckons it could have gone to any one of the players. He added: “I didn’t play as much then in that first six months on loan as I have now – I’ve just managed to break into the team this year and I’ve really enjoyed it. Boss Harvey won’t allow his players to look further ahead than tomorrow, with Premier League and cup specialists Tranent waiting in the wings next Saturday at Prestonfield as the Belters look to secure back-to-back East of Scotland Cup triumphs. “We got beat in the [Fife and Lothains Cup] semi-final by Newtongrange and although I felt we were the better team on the night, we weren’t as good as we should be or can be. It frustrated me and disappointed me that it happened in such a big game. “Hopefully we’ll learn from that semi-final. We’ll approach it in different way and we obviously know what is at stake. We rested players before the Newtongrange game, but I felt it was important to play players on Wednesday to give us a wee bit of momentum going into Saturday.